The normal human heart beats about 100,000 times per day. The normal resting heart rate is about 70 beats per minute but rates of between 40 and 90 beats per minute can occur in normal individuals. The heart rate naturally falls during sleep (sometimes as low as 30 beats per minute in young people) and increases with exercise and emotion. A normal heart rhythm is called sinus rhythm. The name “sinus” rhythm comes from the fact that the normal heart rhythm arises from the sinus node – the heart’s natural pacemaker. Some background information might help when trying to understand heart rhythms. The heart is composed of 4 muscular pumping chambers: 2 atria (singular: atrium) which are relatively small pumping chambers or priming pumps and 2 larger, main pumping chambers, the ventricles. Each of these chambers is composed of millions of heart cells which are too small to be seen without a microscope. It is important that the heart cells contract in a co-ordinated fashion. In order for the heart to pump blood properly, the cells in the atria must all contract together, followed a fraction of a second later by the cells in the ventricle. If the cells contract individually rather than together, the heart chambers would wiggle like a sack of worms and the heart’s contraction would be ineffective. The heart uses an electrical system to co-ordinate the contraction of the heart cells. The heart beat commences when the heart’s natural pacemaker, the sinus node (this is a small group of cells about the size of a cashew nut) fires off a tiny electrical impulse. This electric current spreads through all the cells of the atria within about a tenth of a second, causing all these cells to contract virtually simultaneously. The electrical signal then enters a single electrical connection to excite the ventricles. This electrical connection has a complicated name, the “atrioventricular-node and His bundle” (from now on, I’ll refer to it as the AV node). 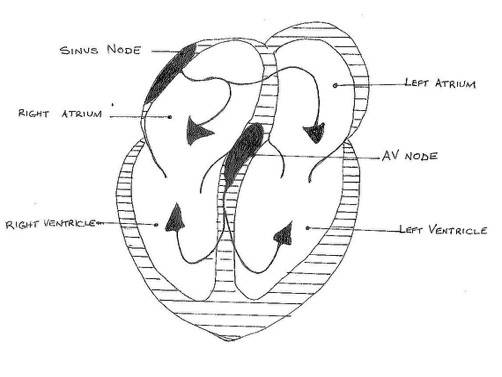 This figure shows the flow of electrical current in the heart: arrows show the electrical current arising in sinus node, travelling through the atria to the AV node, then to the ventricles. Doctors call abnormal heart rhythms “arrhythmias”. Arrhythmias are usually divided into 2 main types, bradycardias, or slow heart rhythms (less than 50 beats per minute) and tachycardias or fast heart rhythms (faster than 100 beats per minutes). A third type of arrhythmia is the ectopic beat. Ectopic beats occur when electrical signals arise intermittently from parts of the heart other than the sinus node. Ectopic beats cause an intermittent, irregular heart beat. Arrhythmias can cause a person to feel unwell because they interfere with the effective pumping function of the heart. When the heart beats too slowly, “the pump runs slowly” and insufficient blood will be pumped to the body and brain. If the heart beats too quickly, there is not enough time to for the heart to fill between heart beats. When the heart cannot fill, it cannot pump enough blood to the body and brain. Not everyone with an arrhythmia experiences all of these symptoms – sometimes a person with an arrhythmia might have no symptoms at all. Arrhythmias are usually caused by an abnormal flow of electricity in the heart. The electrical abnormality is often caused by an electrical short circuit. In some people, these electrical short circuits are present from birth but other short circuits result from heart disease which develops later in life. Some diseases which can cause short circuits include high blood pressure, coronary artery disease, problems with the heart valves, heart muscle diseases (cardiomyopathy), diseases of the thyroid, sleep apnoea, lung disease and many others. Not all arrhythmias require treatment. If the arrhythmia is infrequent or causes few symptoms treatment might not be required. Some of the treatments used to control arrhythmias include medication, catheter ablation, pacemakers and implantable defibrillators. Information about these treatments can be found elsewhere on this site. Some arrhythmias can cause blood clots to form on the inner surface of the heart – these blood clots can detach and travel through the bloodstream to the brain where they can block a blood vessel causing a stroke. Blood thinners may be given to some patients with arrhythmias to prevent this.